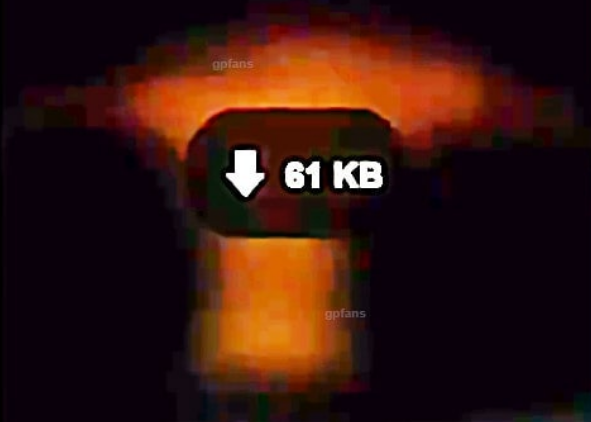 Last edited by UnlikeUday on Thu Feb 14, 2019 1:33 pm, edited 16 times in total. Post subject: Re: 2019 Pre Season News, Launch Dates etc. 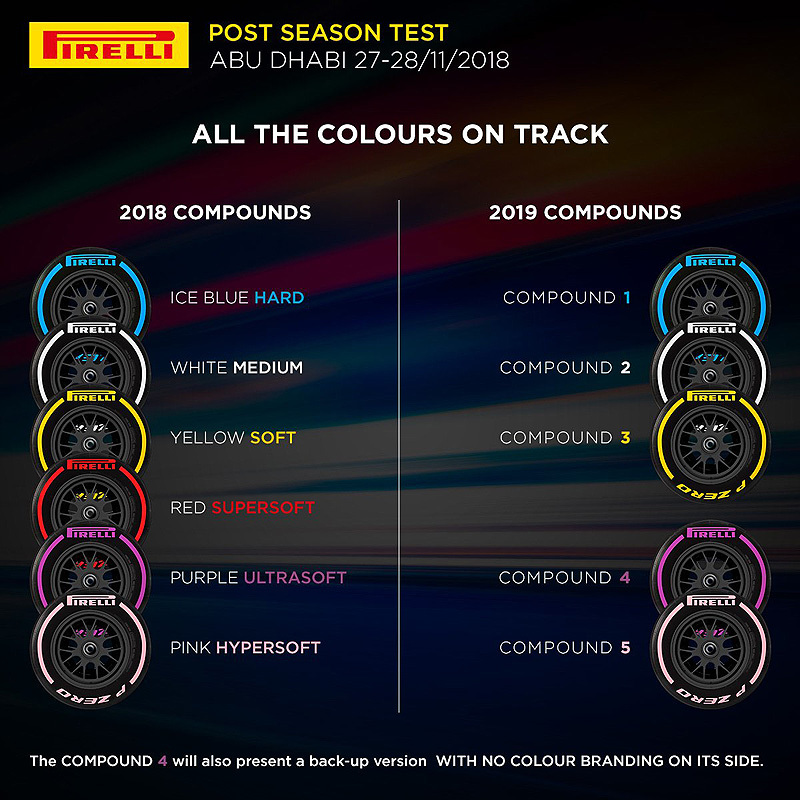 Pirelli has announced the compounds that will be used for the first 4 races of 2019. So Australias hard medium and soft compounds are the same colour as Bahrains colours. Even though the compounds are 1 step up on compound at each of the races. He surely gives important inputs in his commentary & always talks sense. At this rate they will have more pundits than commentators. If it means less of Johnny Herbert then that's fine by me. Most likely I feel Chandhok will play more of a part time "guest" role, like Rosberg did this year. I hope not though because I like Chandhok as a pundit, he's very knowledgeable and I'd like to see him on there regularly. Ferrari is the 1st team to reveal its launch date - 15th February. 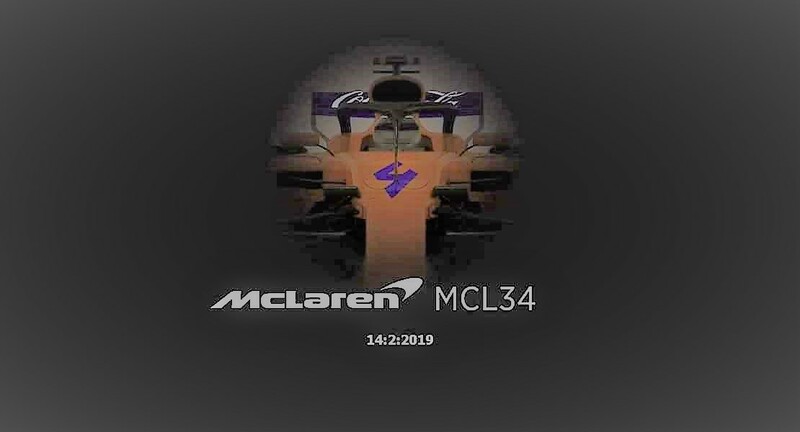 McLaren just put out a tweet saying they are unveiling their new car on February 14th. 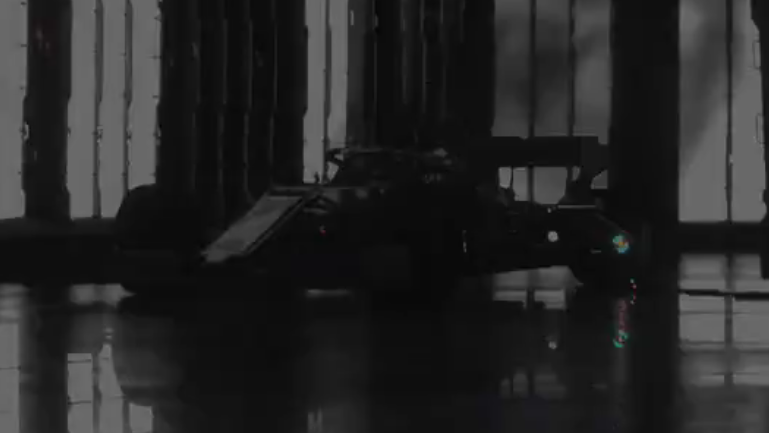 McLaren have given a tease of their car. With the image (or lack of it) it hints to an Orange livery again. This image was posted on McLaren's FB page but was removed. Here's he leaked image which shows McLaren keeping the same livery but one of the 2 sponsors which McLaren has recently joined hands with is visible on the rear wing. Looks like a horrible photoshop. The letters extend above the wing! Sky F1 are broadcasting the afternoon of each day of the first pre season test followed by an hour long review show. Sauber have announced the launch date of their 2019 car. As per the link below, Force India's livery will not be completely Pink. With SportPesa becoming the title sponsor (not officially confirmed though), the livery will adorn Blue & Pink colours. An inside source for the team has confirmed the livery colours. This was a livery design shared on the net. 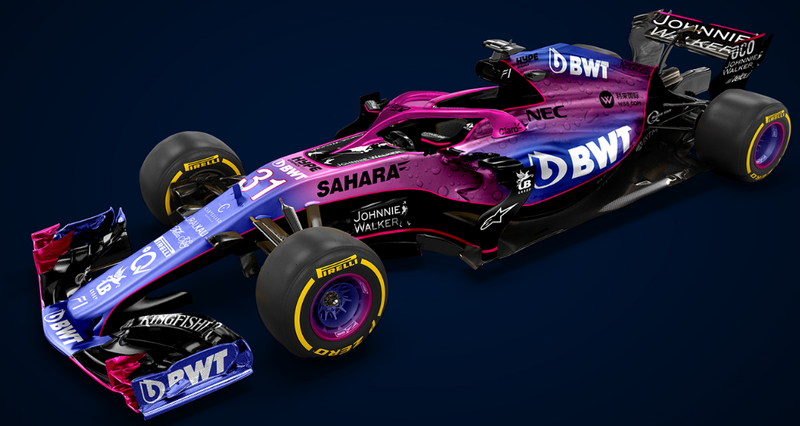 Am attaching here to get a reference for the mix of Blue & Pink livery. 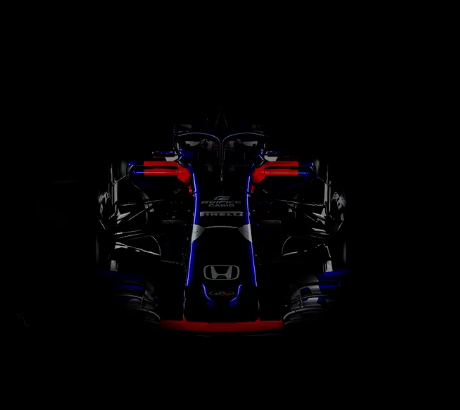 Toro Rosso will reveal their car the earliest - 11th February. Renault did a small tease of how Ricciardo's number on the car would look. I wonder if Renault will have Golden colden incorporated in their livery this year? Toro Rosso have given a sneek peek into their car for the 2019 season. 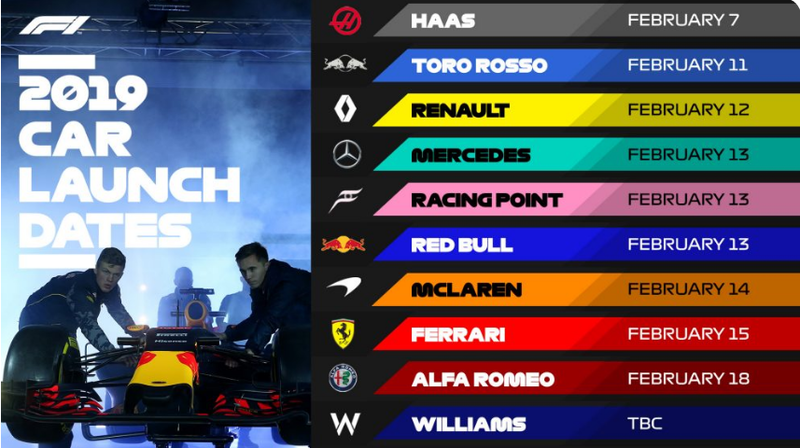 That the 2019 Mercedes will be launched on the 13th of February. Mercedes will launch + running of their '19 contender W10 will take place on 13th February, which will coincide with the launch of Racing Point team. In my opinion it would be great if it was true but I'd be surprised, they will probably do what Red Bull have done in the past and have a great looking livery for testing only and then revert back to basically the same livery as they have had for a long time. Agree. The silver they've had over the last 5 years will be synonymous with their success, surely they won't want to change that from a branding point of view. Hard to judge without seeing the full car but not sure I like what they've teased. I think the Red Bull one in the article looked weird too. The Mercedes thing looks very much like a test livery from the tease IMO. Would be nice to see them mix it up a bit for the whole season though. We atleast have 1 team will a complete livery change (Haas). Williams should have a major change due to Martini not being there. There have also been reports Racing Point will be a mix of Pink & Blue in equal proportions. Updated dates for the launches. 13th February looks like the most exciting (3 launches). Also wondering what Alfa has in store now they've ditched Sauber completely. Williams have finally woken up. Will reveal their car on 11th February. Williams just posted a Pre-Promo on their Twitter feed and in one frame in particular you can see how different the car's general shape is, particularly the front end. They've ditched their smooth sweeping line down from the cockpit to the nose for a more abrupt slant the likes of Ferrari and Sauber. I've taken a screen capture for you guys to see. That depends on how much money it is. Martini didn't give them anything like title sponsor money for all the exposure they got. “We’re expanding very quickly, we’re taking a huge amount of business from them. Some of the biggest drinks distributors in Europe are de-listing Red Bull now."